Joining the vast crowd of dialer replacements in the Android Market, our hunt has brought us to Angel Dialer, an uncomplicated app that effectively replaces the stock Android dialer, but which may have compromised necessary functionality for a no-frills implementation. While Angel Dialer takes a concerted stance against superfluous features, its simplicity is not always a plus. 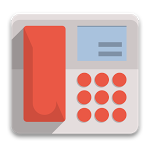 While its features work, and it provides the same basic functionality we've seen before, it is lacking a few things that would take it up a level, and make it a decent dialer replacement.